. : Optics & Photonics Focus :: An Ultraviolet Laser Diode :. According to French philosopher Voltaire (1694-1778) the perfect is the enemy of the good, thus not exactly desirable. As recent results show, however, where scientific research is concerned this may not always hold true. Schematic of a UV laser diode. This schematic shows the 3D structure of the new laser diode by Hamamatsu Photonics. The dark blue layer is the active material which lases at 342 nanometers thanks to the absence of indium. Picture courtesy of Hamamatsu Photonics. Since their invention in 1960, lasers have taken over everyday life: supermarket barcode readers, sliding doors, laser pointers… they all feature lasers! These lasers have nothing in common with the lasers in the TV series Star Trek; our lasers are much humbler laser diodes. Although cheap and reliable, laser diodes are not perfect: they cannot emit light in the ultraviolet range below 343 nanometers. By engineering a better material, researchers at Hamamatsu Photonic in Japan have just broken this barrier and demonstrated lasing at the shortest wavelength ever for a semiconductor laser diode. Why lase in ultraviolet? In the electromagnetic spectrum, the wavelengths that we can see range from 380 (violet) to 750 nanometers (red); ultraviolet light (UV) lies just below this range. Even though we cannot see it, UV light finds applications in many fields, ranging from healthcare to security issues. In medicine it is used for diagnosis, therapy, analysis, sterilization as well as for water or air purification. In security issues credit cards, passports, or banknotes from various countries often contain special UV watermarks to help thwart counterfeiters. The function of a laser is defined by its acronym: Light Amplification by Stimulated Emission of Radiation. Laser diodes (LDs) are a subgroup in the wider family of lasers, where the amplifying medium is a semiconductor. Where the wavelength of the emitted light is concerned, the material is fundamental. If gallium nitride or gallium arsenide are indispensable ingredients in the recipe, indium or aluminium can be added to the mixture in order to further shift the wavelength of the emission towards the infrared region or the UV region respectively. For laser diodes, however, it has been difficult to shift the lasing wavelength towards the shorter UV region . Indeed, progress in improving the material quality was limited by the fact that layers with high aluminium content tend to crack easily if indium-free. Yoji Yamashita at Hamamatsu Photonics, co-author of the work, explains that "high aluminium content and crack-free films are sine qua non conditions for designing UV laser diodes. 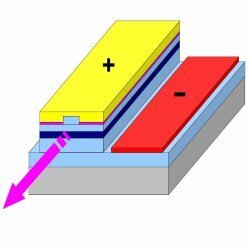 Furthermore, the selection of the active layer, which acts as the amplifying medium, was yet another problem: the presence of indium is a big disadvantage when moving towards shorter wavelengths. And yet, we were able to solve these issues!" For blue-violet LDs the efficiency of the emission is improved by the presence of indium-rich clusters. The inclusion of indium in the active layer, however, inhibits emission at shorter wavelengths, such as in the UV region. Ulrich T. Schwarz at the University of Regensburg (Germany) points out that "the absence of indium in the LD by Hamamatsu is an interesting point. In other words, it is exciting to see that an indium-free LD also works at 342 nanometers, as all other groups claim that indium is necessary or at least advantageous for lasing in this range: 343 nanometers has been achieved before." These findings pave the way towards achieving much shorter wavelengths for LDs. LDs, like light emitting diodes (LEDs), are semiconductor diodes which can emit light when activated by an applied electrical current. In addition, they are both undistinguishable below the lasing threshold. Given this strong connection between LEDs and LDs, sense would dictate that we should expect LDs to emit light down to 240 nanometers, since LEDs at this same wavelength are already available on the market. Of course, the material requirements for lasing to happen are much stricter than those needed for the spontaneous emission of light in LEDs. Schwarz, indeed, adds, "I would assume a lifespan of less than a minute for such UV LDs. This estimation stems from 405-nanometer LDs with similar input power. For these UV LDs the lifespan could be even shorter due to additional degradation mechanisms. To increase the lifespan, an efficient p-doping, as well as diminished optical losses, and freestanding AlGaN substrates, are necessary." According to Yamashita, "indium-free AlGaN materials are suitable for shorter wavelengths. This work has only been the first step to demostrating an electrically driven UV laser diode, but we aim to engineer laser diodes for shorter wavelengths and with higher power." He adds, "UV laser diodes are bound to find application in chemical and biochemical analysis." Ulrich Schwarz, furthermore, envisions for such devices "important applications in bio-photonics, material processing, sterilization, and next-generation data storage. I could only speculate as to which is likely to have the largest impact on the market." U. Schwarz, Indium-free Success, Nature Photon 2, 521-522 (2008). Harumasa Yoshida, Yoji Yamashita, Masakazu Kuwabara, and Hirofumi Kan, A 342-nm ultraviolet AlGaN multiple-quantum-well laser diode, Nature Photonics (2008) 2, 551-554 (link).